There are more beautiful choices than ever before from all parts of the world just Gorgeous! 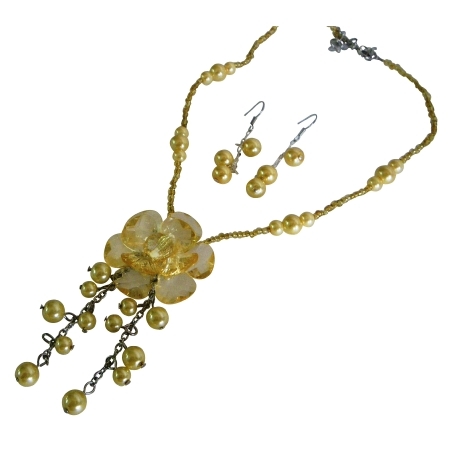 In Yellow Daffodil tiny Bead accented in beautiful Necklace with Yellow Glass Flower Pendant Dangling yellow Pearls with Matching Earrings in 8mm pearls in nickle free french hook Pearls is being adorned as one of the best top Pearls Necklace set. Beautifull Gift for some one you love for all ages. It is all time beautifying wardrobe Jewelry! BridesmaidBridal Flower girl Prom Wedding set & A party on the neck all the time.! !.